There is no greater satisfaction than delivering a finished product that helps a client reach their goals and objectives. 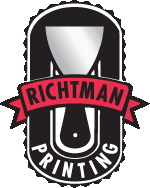 To learn more about the Richtman Printing approach to customer service, follow the provided links for more information. We at Richtman Printing are proud of the strong roots we've built in our community. We pride ourselves on being a complete source for all of your business communications needs since 1988. We understand that an investment in technology can actually save money by improving efficiencies.